Thursday September 20th 1900 Willie Anderson and man helped haul today and they filled the car before night. I had baking and churning on hand was hard at work most of the day. I got time to write a letter to Hatt in the afternoon & to Monica Culbertson acknowledging the reciept of the years settlement. 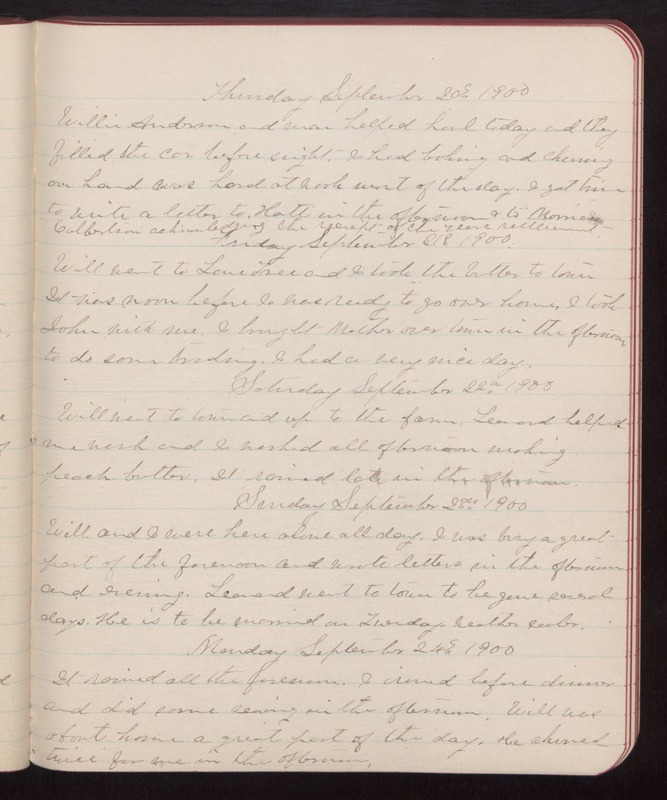 Friday September 21st 1900 Will went to Lone Tree and I took the butter to town It was noon before I was ready to go over home, I took John with me. I brought mother over town in the afternoon to do some trading. I had a very nice day. Saturday September 22nd 1900 Will went to town and up to the farm. Leonard helped me wash and I worked all afternoon making peach butter. It rained late in the afternoon. Sunday September 23rd 1900 Will and I were here alone all day. I was busy a great part of the forenoon and wrote letters in the afternoon and evening. Leonard went to town to be gone several days. He is to be married on Tuesday. Weather cooler. Monday September 24th 1900 It rained all the forenoon. I ironed before dinner and did some sewing in the afternoon. Will was about home a great part of the day. He churned twice for me in the afternoon.